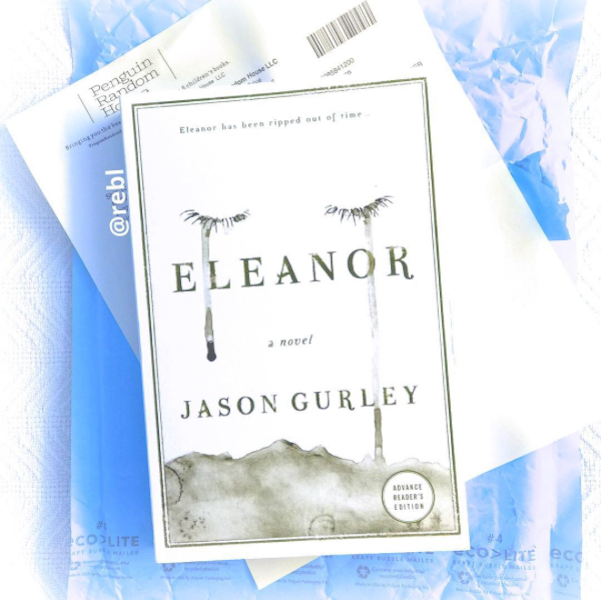 Eleanor: A Novel by Jason Gurley opens with every reader’s dream–a rainy Sunday, a steaming cup of tea and a private nook. Moving deeper, “Sometimes Eleanor [grandmother of the titular Eleanor] swore her life was being written by someone else’s hand.” Yes. I recognize this person. At this point, I am reading a compelling story about the legacy of maternal depression. The YA Fantasy switch flips at page 72. It is sudden and upsetting because I long for grandmother Eleanor’s story and I enjoy the way Gurley squeezes the desperation out of it. I remember from the galley copy that this is YA fantasy and Gurney’s writing is compelling, so I continue turning pages. As a slow reader, it might take me a month to read a similar book. This one only took a week, even though working for a bookstore and having a family, this particular week is one of my busiest of the year. The book follows Eleanor, whose twin sister Esmerelda dies in a car accident. Eleanor’s mother, Agnes (daughter of idyllic book nook owner, Eleanor), turns to booze for comfort. Eleanor’s father divorces Agnes, leaving Eleanor to take care of her mother with only her friend Jack for help and comfort. As Eleanor’s life becomes increasingly unmanageable, she unwittingly begins transitioning between supernatural worlds at great physical cost. In those worlds Eleanor meets a mysterious being named Mea who, with the company of another being named Efah, has been watching Eleanor and “helping” her move between the worlds with the hope to undo the damage of one mother’s decision. Yeah, it’s a lot, but if readers stick with it, it gets easier to understand. [Possible spoiler in next two paragraphs.] If ever there was a story that perpetuated a child’s foolish dream of reuniting divorced parents and “fixing” an alcoholic parent, this is one. Horrible, tragic things happen in everyone’s life and I personally prefer a story that helps people cope, rather than one that rights the tragic choices others make with magical efforts. This is my biggest criticism of the book. Anyone who loves an alcoholic will recognize the wishful enabler in Eleanor. On the other hand, everyone has some sort of fantasy, and this is a fantasy after all. My heart is heavy for the character treatment of Jack, who gets the crap end of the stick during the action and when the action is resolved. He is alone in his own family’s tragedy and never secures the solace or love he searches for in Eleanor. Perhaps Jack serves as the balance to Eleanor. Not everyone has a happy ending. Poor Jack. A couple of the dialogic scenes between the main character Eleanor and her father feel melodramatic, but they are a tiny weakness in an otherwise well-written novel. Based on readability, I would seek out other works by Gurley. Although I enjoyed reading Eleanor, it’s hard for me to think of who I would recommend it to because young people who face the tough experiences of dysfunctional families need perspective that this book does not provide. I do think this book would make for an engrossing book club discussion.